Digital Pianos - Your Ultimate Guide from Andertons Music Co. In the market for a digital piano? There are more options on the market than ever before, from the likes of Yamaha, Roland and Casio among others - it can be difficult to know where to start. In this handy guide, we'll explore the big questions and crucial considerations to help you find the best piano for you, whether you're a beginner or a seasoned classical player! Here at Andertons Music Co. we understand that buying a new piano can be a lengthy process with lots of questions that need answering. The piano market is full of confusing terminology and lots of different products for different types of people. Shop Pianos & Keyboards Now! What are the different types of digital piano? Home Piano – as you may have guessed, home pianos are 88-key digital pianos designed primarily for home use, remaining stationary. They’ll often have built-in stands and speakers, and in some cases will appear very similar to upright or even grand pianos. They also feature subtle styling to ensure they fit in nicely with your décor. Upright Piano – upright pianos were originally designed as a smaller version of a grand piano. The strings are vertical, meaning the frame is more compact but taller. Digital upright pianos mimic this tall design, using the increased space to improve key action and quality of speakers. Stage Piano – unlike home and upright pianos, stage pianos are designed to be portable. They’re often slightly more compact, and are designed to be compatible with various stands and inputs/outputs. This makes them great for gigging and session work. Portable Piano – in some ways, this is just another name for stage piano. No stand included, and you can easily connect them to your own headphones, interface or output of choice. Lightweight, compact and easy to carry around. Grand Piano - yes, there is such a thing as a digital grand piano! If you're looking for luxury and grandiose aesthetics, look no further! What are the most important digital piano features? If you're in the market for some sort of digital piano, you probably will have encountered the term 'weighted'. As it suggests, it simply refers to the feel of the key action. Acoustic pianos have a distinct feel; the keys are heavy and responsive to touch – so what’s the difference between weighted and non-weighted keys? What are the types of weighted keys? Non-weighted - keyboard controllers and smaller keyboards normally have thin, lightweight keys with little resistance. Semi weighted - thanks to a spring-action mechanism, you'll get more resistance with semi-weighted keys. This means a slightly more realistic feel. Hammer action - this is simply replication of the feel of an acoustic piano. It's often achieved by weighted leverage to add extra resistance to the key action. Graded weighting - this is more advanced replication of acoustic piano weighting, in that lower keys are made to feel heavier than higher keys, with a gradual increase up the keyboard. Most digital pianos have some form of weighted keybed. Roland’s PHA key action is an incredibly popular form of hammer action, offering an authentic ‘real piano’ experience at a fraction of the cost. How many sounds do digital pianos have? While acoustic pianos sound undeniably glorious, they only sound like one thing: an acoustic piano. One of the advantages of modern digital pianos is that they feel extremely similar to acoustic pianos, but offer far more sounds. The number of sounds available on a digital piano varies depending on price and brand. Many affordable entry-level pianos offer a handful of sounds (between 5-20); this allows you to get used to playing different musical styles without having too much choice. Medium-level pianos offer a little more choice, introducing a better selection of piano sounds as well electric piano, organ, orchestral and more. Premium digital pianos naturally offer a premium selection of sounds to boot. Many brands invest a lot of time and money into reproducing some of the most iconic American (Steinway & Sons, Mason & Hamlin etc. ), European (Renner, Abel, Bösendorfer etc.) and international (Kawai, Stuart and Sons) piano sounds. Many flagship piano ranges offer upwards of 300 sounds for maximum flexibility, making them great for recording, rehearsal, performance – just about anything. Can I record with a digital piano? 3/4” jack – this is the industry standard instrument audio connection. Most digital pianos will have a 3/4" jack connection, which can be easily connected to an audio interface, mixer or amplifier. 1/4” jack – also known as the 3.5mm jack. This type of connection could be used for connecting headphones or external sound sources like smartphones, tablets and laptops. XLR – the standard microphone-style connection. Some digital pianos may have this connection, which offers what’s called a balanced signal. This basically means it’s clearer and less susceptible to interruption or loss of quality. MIDI – the universal digital language of music. A MIDI signal carries information on pitch, volume, velocity and much more. Having a MIDI connection allows you to tweak every bit of your performance afterwards. Because it’s universal, it works with hundreds of DAWs and apps. USB – this will either allow you to connect directly to a computer or insert your own flash drive for audio playback. This makes recording and tweaking your sound super easy, and is a handy tool for learning and practicing. Bluetooth - the simplest of wireless connectivity. Many modern digital pianos are Bluetooth compatible, allowing connection to smartphones, tablets and computers. This usually means you can play backing tracks and tweak your sounds, but in some cases, you can even transfer MIDI or use your piano as a Bluetooth speaker! Where should I put my digital piano? Pianos are large instruments in the grand scheme of things. With this in mind, it’s worth considering where you’re going to put it before you purchase! Finish – digital piano finishes can often be grouped into four categories: black, white, brown and natural. Natural often means a wooden texture like Oak or Pine. Whether you want your piano in the living room, study or dedicated studio space, one of these four styles is bound to work! Space – as most digital pianos have 88-key ranges, they’re usually pretty bulky. If your space is limited, consider a stage or portable piano. This allows you to choose your own stand, plus they’re normally slightly more compact. If you’ve got more space, home and upright pianos tend to offer a better sound and more authentic experience! Noise – digital pianos make noise. Not just out of their speakers, but the sound of tinkling on keys and tapping on pedals might bug the neighbours. You can easily connect headphones for quieter practice, but think about where you want your piano if you’ll be tapping away into the small hours. How much do digital pianos weigh? 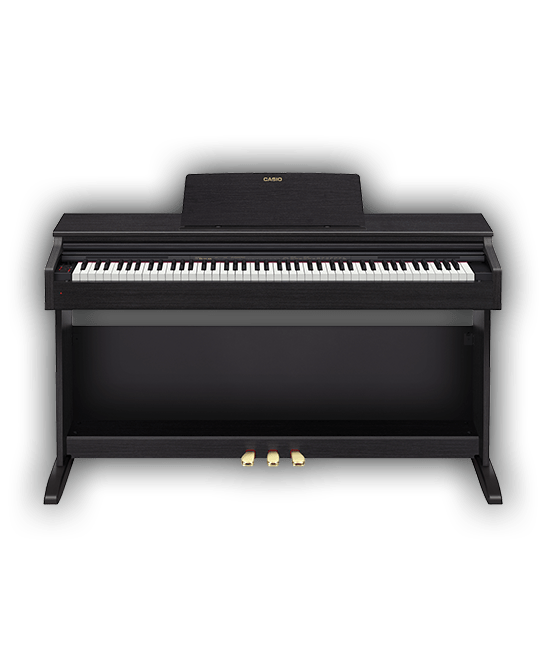 Digital pianos can weigh anything from just over 10kg (Yamaha P-45) to 110.5kg (Roland LX708) – that’s how varied it gets! But it does depend on the intended purpose. Obviously, portable and stage pianos are lighter. Home and upright pianos are heavier, because they have more features, more complex key mechanisms, bigger speakers and so on. If you’re concerned about delivery, we offer free UK delivery on all our digital pianos, so you don’t need to worry about lugging it home or loading it in the car. How much do digital pianos cost? Digital pianos are an investment. In a similar way to acoustic pianos; once you buy one, you’ve got it for good. The advantage of having a digital rather than acoustic is that you don’t need to worry about tuning it every now and then! That having been said, the advancement of technology means that great digital pianos are more affordable than ever. You can get an authentic-feel digital piano for less than £500 that’ll do everything you need. Plus having access to so many great features at that price point makes them great for beginners, students and budding musicians. On the other end of the spectrum, a premium digital piano can cost upwards of £4000. These represent the cream of the crop, so to speak. If you’re looking for the ultimate piano experience for home, studio or stage use, it doesn’t get much better. When you consider that acoustic pianos often start around £2500 and go up to £20000+, it puts the cost of a digital piano into perspective. Yes £4000+ is a lot of money for a digital piano, but without maintenance/tuning costs, you could potentially save an awful lot. Couple that with the huge choice of sounds, the pinch-yourself authenticity of modern digital pianos, and extended warranties (Roland offer 10 year warranties on some of their pianos! ), it all starts to add up! Can I learn on a digital piano? Digital pianos are great for learning – it’s as simple as that. Having the same feel and sound as an acoustic piano ensure that you quickly get an ear for dynamics. It also means that you build up strength and dexterity. But it doesn’t end there. Many companies design their pianos with learning in mind. You’ll often have access to backing tracks, example songs & pieces, a built-in metronome – plenty of tools to help you along your musical journey. Brands like Roland have gone as far as designing a series of apps that make learning piano more enjoyable and interactive than ever before. Leading the charge is Piano Partner 2, a free app for iOS and Android. It gives you access to all of the features of your Roland digital piano, so you can easily browse and get to grips. You can record, practice with backing tracks, do rhythm and pitch exercises and much more. What’s the best digital piano brand? Japanese manufacturer Roland are truly titans of the category. We're a Roland Planet specialist, meaning we have one of the most extensive selections in the UK. Roland digital pianos, stage pianos and keyboards are among some of the most sought-after in the world! Clavia Nord are well-respected in the industry, known for their distinctive bright red instruments. Offering everything from compact old-style synths to 88-key stage pianos, they're used by some of the biggest performing artists in the world. Key products include the Stage and Lead ranges. Yamaha are known for producing musical gear in just about every category. But this isn't a master of none scenario; they remain at the top of their game, with Yamaha digital pianos being among our all-time best-selling items! They also produce a reputable selection of synths, keyboards and workstations for all applications. Casio offer a fantastic range of affordable pianos and keyboards to suit every stage in a pianist's journey, including their flagship Celviano range. Featuring keyboards with built-in lessons for the beginner, to professional digital pianos with a real Bechstein Piano action, there really is something for everyone. Perhaps better known for their synth offerings, Korg also produce a great selection of digital pianos with a variety of features. From compact synthesizer keyboards to world-class workstations like the Kronos range, Korg are firmly established as a key player in the category (no pun intended). How many keys do digital pianos have? Most digital pianos will have 88 keys, just like their acoustic counterparts. This ensures that your playing experience is authentic and enjoyable, so you can get the most out of your piano. Some stage pianos offer realistic weighted feel with smaller ranges, making them more compact and portable. Why do pianos only come in black and white? For the most part, you’ll notice that pianos are either black or white, but it isn’t always the case. Traditionally, larger pianos (i.e. acoustic grand pianos) feature large wooden panels, often made from multiple pieces of wood. Matching grains on this wood proved to be difficult, so piano makers opted for solid finishes to ensure consistency – the results are striking. So it came to be that pianos were mostly solid black or solid white, often polished for that added luxurious touch. Many digital piano manufactures offer traditional black / white polished finishes for extra authenticity. But you’ll also see brown, red and cream varieties as well as natural wood-style finishes like Mahogany and Rosewood. This means that you’re guaranteed to find a piano that suits your style or décor. Do all digital pianos have headphone sockets? These days, we can safely say yes. While most digital pianos have built-in speakers, the option of plugging in headphones or your own speakers is essential. As mentioned earlier, headphone connections vary between the standard 3/4" jack and 1/4" auxiliary-style connection. What do piano pedals do? Soft – also known as the una corda pedal, this traditionally shifted the piano hammer action to one side. This meant a softer, less direct impact on the string, resulting in a softer sound. Sostenuto – this pedal sustains only notes that are held when it’s pressed, meaning other notes are unaffected. In some cases, this is referred to as the practice pedal, with an alternative function that significantly reduces the volume of notes played. Sustain – the most common pedal, sustaining notes for a lush, textural sound. Do digital pianos come with pedals? Not all of them. Some digital pianos include a sustain pedal – these often work with any piano, connected via 3/4" jack. Because they’re usually universal, you can buy any brand. Check out our selection of piano pedals here. Can you connect a digital piano to your computer? As mentioned earlier, digital pianos tend to offer a variety of connections. If you want to connect for recording purposes, most have a 3/4" jack output so you can record audio straight into an interface. Some have MIDI connections (requiring a MIDI-compatible interface) so you can tweak your sound after recording. Then there’s the option of USB or Bluetooth connectivity, which allows everything from sound tweaking to wireless MIDI recording – the short answer is yes! As most digital pianos have weighted key action and an 88-key range, you’re already half way there. But for classical, you’ll want high quality acoustic piano sounds, a responsive keybed and fully-functioning pedals too. This will allow you play with accurate articulation, which is crucial in classical music. Roland developed their PHA key action specifically to cater for musicians looking for that classical piano experience. Ivory feel, extra-long and individually weighted keys offer a brilliant piano performance that’s perfect for classic music. Brands like Casio and Yamaha also offer top-notch design aimed at classical musicians; check out their Tri-Sensor Scaled Hammer Action II keyboards GH3 action keyboards respectively. What’s the best digital piano for playing concerts? For gigging pianists, a portable or stage piano will be best. These still offer authentic feel and sound, but are designed to be more compact and portable. They also tend to be easier to carry, pack in the car or take on public transport and compatible with most stands and connections. Roland’s FP range of digital pianos is ultra-popular for its simple interface, realistic sound & feel and its affordable price tag. At the top of the range, brands like Clavia Nord produce world-class offerings with heaps of professional features – a true investment. As mentioned above, brands like Korg, Casio and Roland produce great home and portable pianos with handy features and affordable price tags. This includes great connectivity, built-in metronome and backing tracks, authentic key action and simple interfaces. This makes them great for learning, both for children and adults, without busting the bank! Click here to check out the best digital pianos for beginners! What’s the best digital piano for jazz & blues? Look at options with more sounds on offer. If you’re playing jazz or blues, you might want a nice selection of organ, electric piano and clavinet sounds – think Herbie Hancock, Stevie Wonder, Chick Corea etc. Korg and Roland are known for their ultra-realistic sound engines that offer a comprehensive choice. Consider MIDI connectivity too – this will allow you to tweak your sound using a DAW on your computer or tablet. What’s the lightest digital piano? Sometimes the cost of a digital piano can seem daunting but we make it easy for you to buy a piano on finance here at Andertons Music Co. We’ve got plenty of finance options available which you can read about by clicking here. You can spread the cost of your purchase over a period of time instead of paying outright. We have both interest-bearing and interest-free options that you can use subject to status and a credit check by V12 finance. Here’s an example of a 9-month finance deal. If the item costs £1000 then you can take it away on a 9-month interest-free finance package. So, you would pay a minimum 10% deposit (£100) and then have £900 to re-pay over the 9 months. This would mean paying subsequent payments of £100 for 9 months. Shop Keys & Pianos now! If you've enjoyed this handy what's what, don't forget to check the rest of our buyers' guides here - you may just find something that interests you! And if you haven't already, don't forget to check out our selection of keyboards and pianos. You should be feeling a little more informed about the digital pianos, stage pianos and synthesizers - go forth and browse!